Mint Oreo Lasagna - Home. Made. Interest. 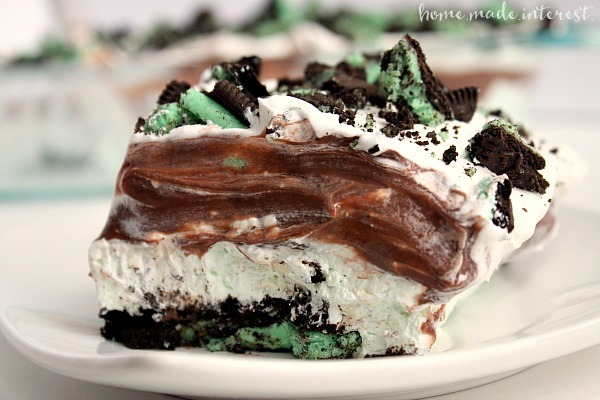 This Mint Oreo Lasagna is a no bake Oreo dessert with layers of mint, chocolate, and whipped topping. 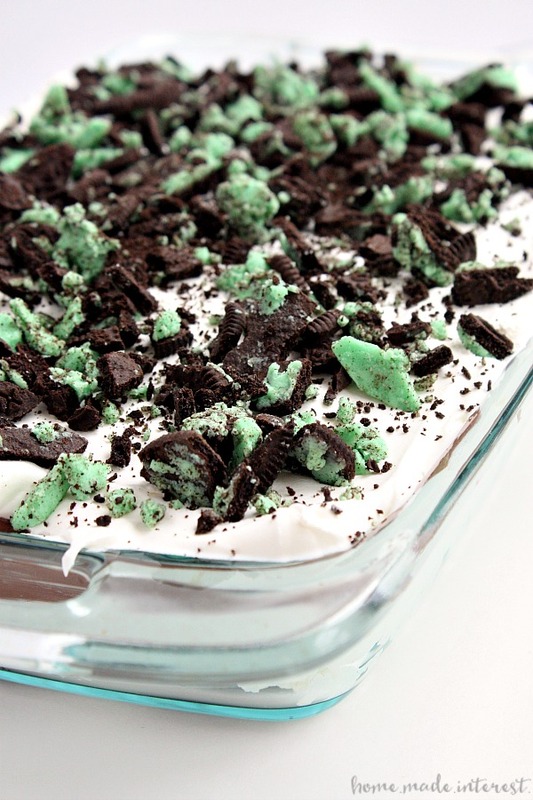 It’s an easy no bake dessert recipe that is the perfect recipe for St. Patrick’s Day! 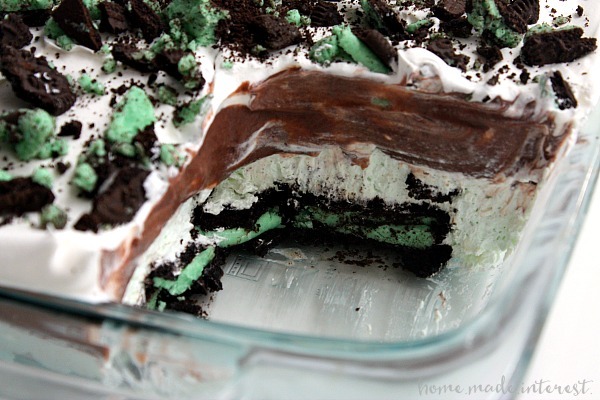 This easy Mint Oreo Lasagna is a minty twist on a dessert my grandma made me when I was a kid. Her version started with a simple crust made with butter, flour, and pecans, and layers of cream cheese, chocolate pudding, and Cool Whip. I’ve changed it up a little over time and one of my favorite versions of the recipe uses Mint Oreos as the crust. It’s a delicious no bake dessert recipe that starts the way anything involving Oreos should, by dunking them in milk. Then you mix cream cheese, confectioner’s sugar, Cool Whip, mint extract, and a few drops of green food coloring together. Layer that on top of the cookies. On top of that put a layer of chocolate pudding, and finish it off with a layer of Cool Whip sprinkled with crushed mint Oreos. Cover the dish and put it in the refrigerator for an hour or two, or overnight, to let the cookies get nice and soft, and then serve! I’m hungry all over again just looking at this. 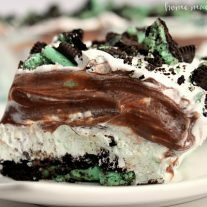 Chocolate and mint is an awesome combination, add cream cheese and Oreos to that and you have an irresistible dessert. I know grandma would have been proud :). This recipe is super flexible. Try out different flavors of Oreos with different pudding flavors. If you don’t like to use Cool Whip you can substitute stabilized whipped cream. Make this a day ahead of time. The longer it sits in the refrigerator the softer the Oreos are. Want more St. Patrick’s Day Dessert recipes? 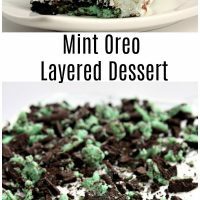 Layers of Mint Oreo, chocolate pudding, cream cheese, and Cool whip make a delicious mint oreo layered dessert that is a fun recipe for St. Patrick’s Day! Make pudding according to directions on the box. Put it in the refrigerator until it has set. Dunk each Oreo in milk and place it in the bottom of a casserole dish. Mix 1 container Cool Whip, cream cheese, confectioner's sugar, mint extract, and food coloring, together until smooth. Spread mixture over the cookies. Spread pudding over the cream cheese mixture layer. Top with a layer of Cool Whip and sprinkle the top with crushed mint Oreos. Put it in the refrigerator and let sit for at least 1 hour. Uhhhm, YES! This looks AMAZING. Thanks Morgan is was delish! You just combined my two of my Absolute Favorites in the world! Can’t wait to try making your recipe myself! YUM! What size casserole did you use? Hi Bethany, it’s green food coloring.